And sleeves! And it looks a lot like a sweater! I think this is taking as long to make as my sweater took, maybe longer. Granted, I only have 1 good hour to knit most days, and some days less than that, but it just feels like this sweater is going SO S L O W! However, it is coming along and since we have at least another week of 80-degree weather ahead of us, I do still have time. 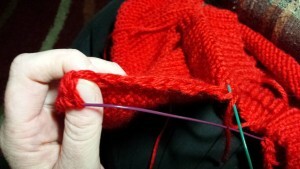 I ended up closing the pockets up along the zipper edge of the sweater as I knit them up the sweater. It worked out really well. 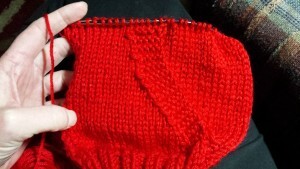 The pattern says to pick up stitches for the pouch one row above the ribbing. I picked up half the required number of stitches from the zipper edge out toward the side. I followed the instructions for the shaping and edging for the pocket, but had to somehow close the pocket at the zipper edge. 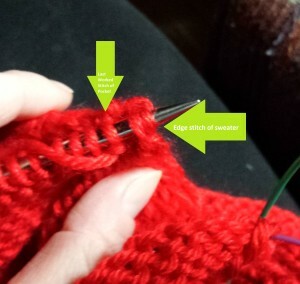 Typically what I do on edges where I know I’ll be picking up stitches later is to slip the first stitch of every row, instead of knitting/purling it. (I’ll be picking up those edge stitches to knit a band for the zipper to be sewn to.) That makes for a really clean edge like you see here on the edge of the sweater body. 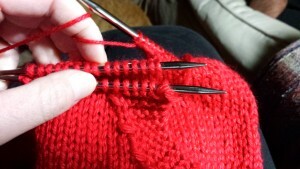 This means there is one edge stitch for every two rows of the main fabric. One edge stitch for two rows. Click on the photo to see the text details in the arrows. 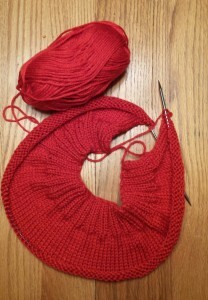 …and knitted or purled (depending on which pocket I was working on) them together with the last stitch of the pocket. 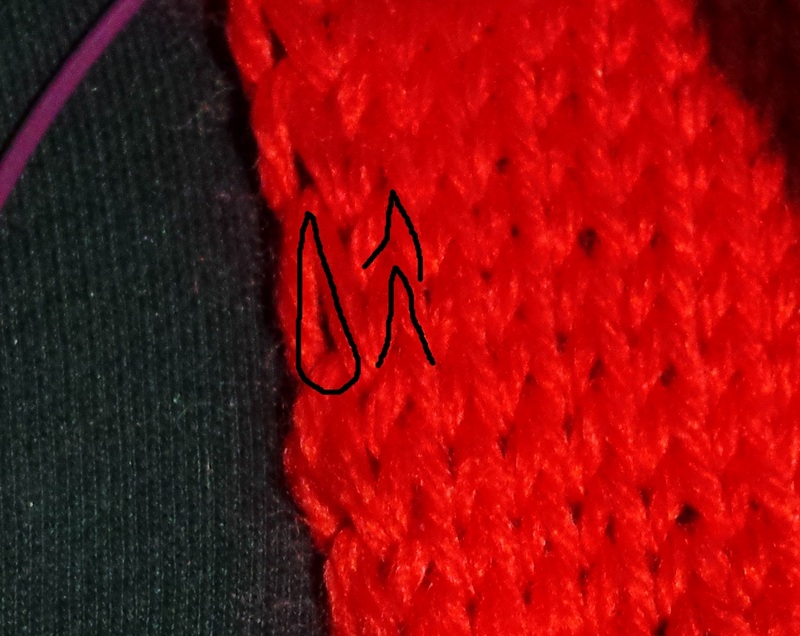 Purling edge stitch of the body together with last pocket stitch. This quite neatly closed up that side of the pocket that I was worried about. 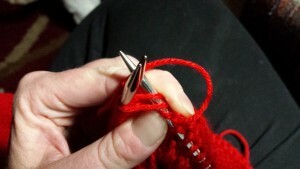 Then I just fused the pocket to the body by knitting the stitches of the pocket together with the corresponding stitch of the body along the top of the pocket. 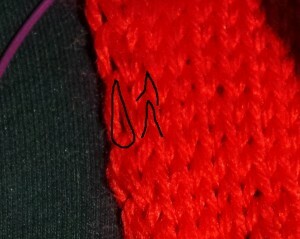 Pocket on front needle, sweater body on back needle. 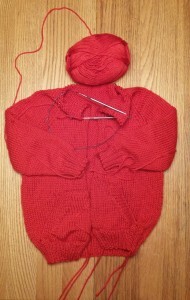 Knitting pocket and body together. 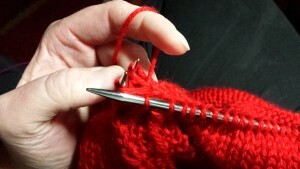 Pull the stitch through both loops. 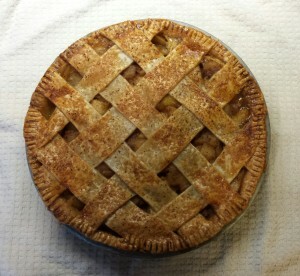 It turned out to be easy-peasy and I’m pleased with how it looks. We had Jellybean try it on before I finished the raglan decreases in the yoke and darn it if I’m not going to have to make the sleeves longer. This kid just keeps growing! The end of the sleeves comes right down to just above his wrists, and of course the sleeves are knit from the cuff up. No worries, though. When I finish the rest of the sweater, I’ll fix it. I’ll have to rip back all of the decreases (it was also tighter than I’d like at the cuff), pick up the stitches and knit down from there, decreasing more slowly (every 5 rows instead of every 4) and do one less decrease. I’ll show you how I manage that, too, when I get there. Do you remember last year’s sweater? Jellybean has suddenly decided that it’s cool and he’ll wear it every chance he gets. I’m sure it has something to do with the Daniel Tiger episode where he learns to button his coat. After watching that episode, Jellybean remembered his sweater and put it on, buttoning all the buttons himself. (We actually sing the “Keep Trying” song a lot – we’re at a stage where we hear “I can’t do it! !” quite frequently.) He’s still excited about his new RED sweater, though! Several times I’ve been tempted to buy him a light fleece jacket for playing on the playground at daycare so he doesn’t ruin his sweater. I stop myself every time, though. Where will he wear his sweater, if not daily on the playground? If it gets dirty or torn, I can wash or repair it. I would rather he wear this one and I have to repair it than it sit at the house shiny and new because I don’t want it to get ruined. I hope he really does want to wear it daily. I would be so proud and honored. Oh, it’s been two weeks? Well, yes, that would explain it. We’ve had to travel, we’ve had sick kiddos, knitting and crocheting have not gone as planned and I’m so irritable I can barely stand to be around myself. But I made a pie. 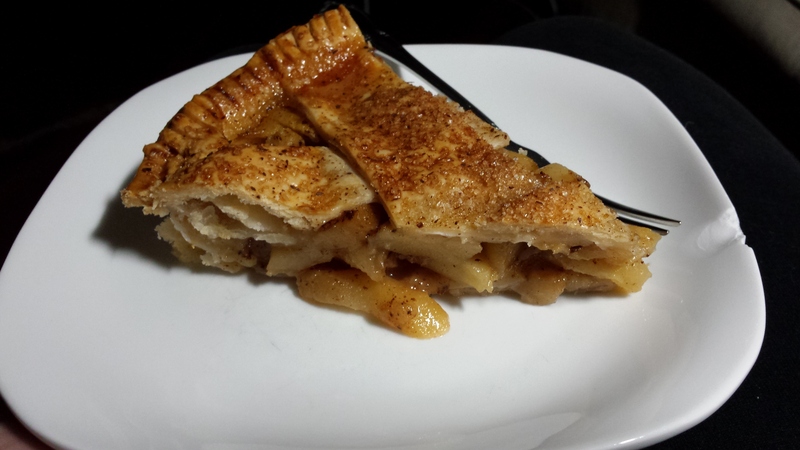 A really beautiful, tasty apple pie. Thank you, Southern Living magazine! We’ve had sick kiddos around. I got a call Wednesday morning, before I even left the driveway to go to work, that Jellybean was sick. He got through the stomach issues, took him back on Thursday and I got a call about an hour later that he had a rash. Friday morning, the rash was worse and he had a fever. That afternoon we left the doctor’s office with a positive Flu test, positive strep test, flu shot for me, a prescription for antibiotics and a diagnosis of Scarlet Fever. Jellybean never had a sore throat, the only indication of strep was the rash and fever. We’re convinced the flu test was a false positive. Of course by Saturday morning, he as acting like nothing was ever wrong, but he still had to be out of daycare for more than a week. Lollypop got to stay home this past Monday, too. He has this habit of not napping well on the weekends. On the one hand, I get it, he’s excited to see his family and doesn’t want to miss any action. But on the other hand, holy moly it makes it tough when he loses his mind along about 4pm. He’d been coughing quite a bit on Sunday night and was congested with runny nose and watery eyes. So, out of an abundance of caution, we all stayed home Monday. I did manage to get a 2-hour nap out of him and a 1-hour nap out of Jellybean that day, so at least I was able to work a bit and he was feeling much better the next day. Lollypop is starting to get mobile and sit up on his own better. I’m excited about this – he’s less reliant on me for his every need. But it also means I can’t just lay him somewhere and expect him to stay there. We’ve started feeding him rice cereal from a spoon and he LOVES that! Our next step is trying some purees. I think I’ll get some peaches and see if he likes those mixed in with his cereal. 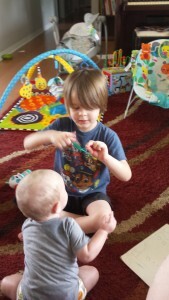 He’s curious about everything, and thinks his big brother hung the moon. Jellybean is being so sweet to him, too. 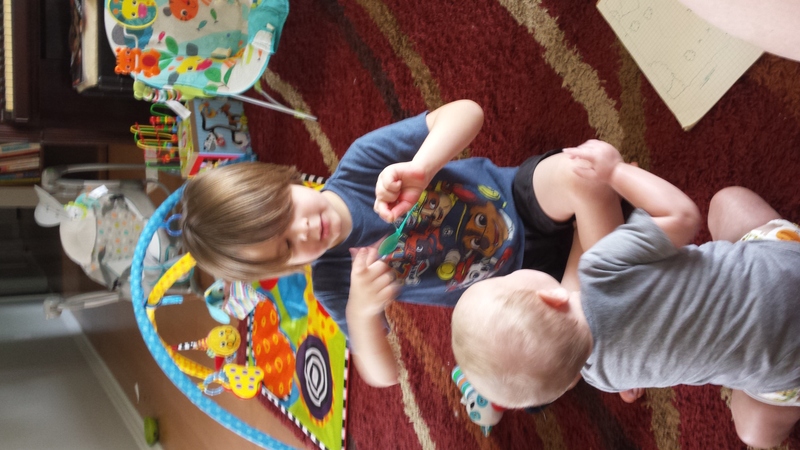 They’re starting to play together and JB will read LP books and hug on him. It’s really wonderful to watch their relationship grow. It’s impossible to get a non-blurry picture of them. On the knitting side, I’ve cast on and ripped out so many times I’ve lost count. I started a Christmas present in crochet. I have no clue about gauge in crochet, so I just had to restart that one three times until I got the size right. That one’s a lap-sized afghan, so it was a bit of work to rip out. Of course I can’t show you yet, it’s that time of the year! 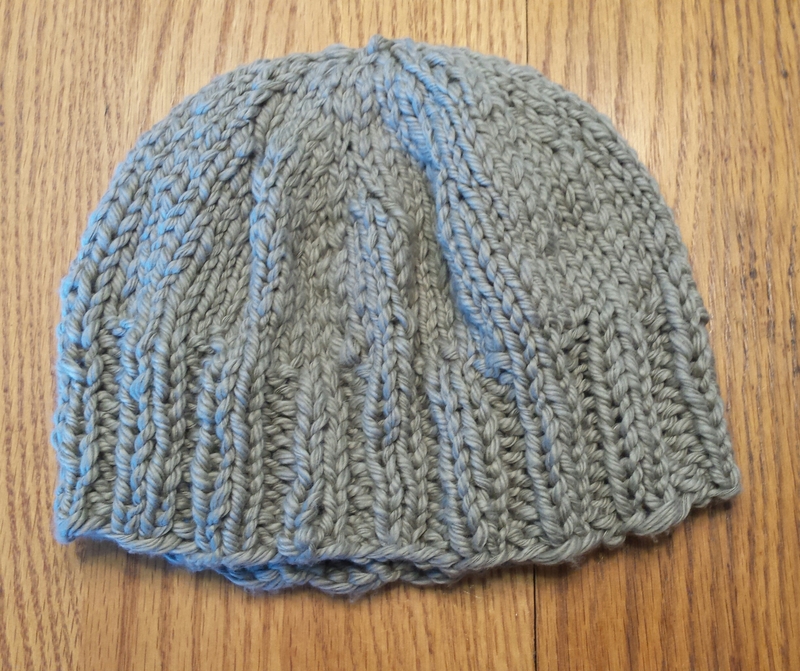 I also made a hat. 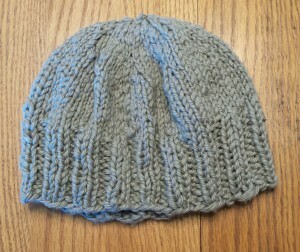 I used instructions for a hat made with worsted weight yarn, but I was using bulky weight yarn. I ripped that one out once and I’m afraid it still might be too big. A little more progress than last time. Note to self: Read the pattern before beginning! I am NOT ripping out two inches of stockinette! I will just pick up stitches for the pockets, knit the pockets and figure out how to close the pocket next to the zipper later. I can use mattress stitch, but it won’t have the same stretch as the rest of the sweater. 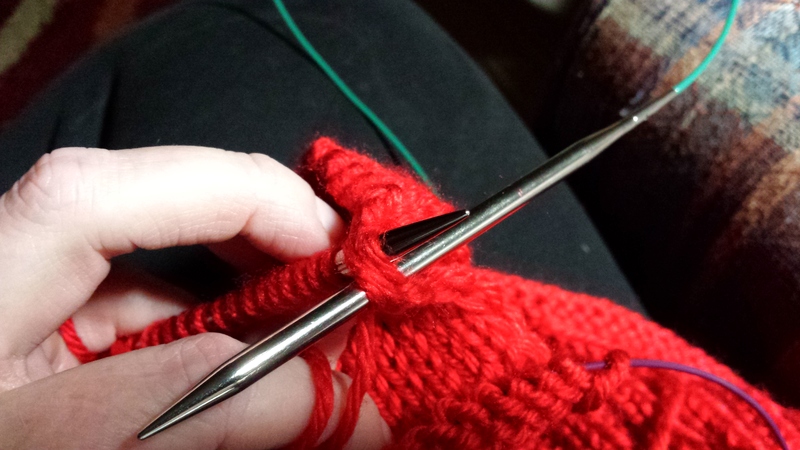 I can probably do a single crochet or slip stitch crochet thing on the inside of the pocket that would stretch some, but I’m not sure how that will look on the outside. I’ll have to think on that one. Do you have any suggestions? I’ve paused on the Evenstar shawl for a bit. Fall weather is here this week and I decided I needed to focus on cold-weather wear. I still need to finish Lollypop’s stocking, sew up his sweater and find the perfect buttons for it. I have had to add a few new projects to my list, too. Jellybean came out of his room crying this week because his felted slippers don’t fit anymore. He was so very sad. He said, “Mama, make it go on my foot!” He got really upset with me when I told him they don’t fit anymore, but was better when I told him I would make him a new pair. And a new pair of mittens. Also, Jellybean and Lollypop need winter hats. These kids just keep growing!! Let’s hope this next week goes better than the last two and I get some projects finished. We all need a break from the craziness!